In the farming wine business over the last twenty years, the existing buildings have been modernized to accommodate a cellar equipped with modern instruments which help us to work better at every stage of wine making. The white grapes are obtained by soft pressing, followed by immediate cooling of the must, which after a decantation period ferments slowly at controlled temperature. Red grapes after separation from the rasp start to ferment with peels for 8/10 days. The same coloring substances, tannins and some aromatic substances are extracted from the peels; at the end of alcoholic fermentation in the wine, the lactic acid fermentation results in a greater softness. 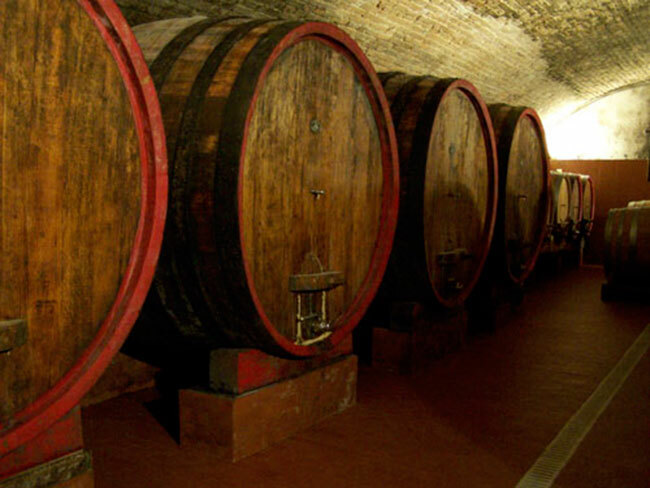 After a series of dressings with the purpose of separating the lees from the wine, the red wines destined for aging are transferred to the old underground cellar of the castle where the wines remain matured for about two years in small and medium capacity oak barrels. For a few years there is a separate room in which bottling takes place, even here a modern plant helps us to preserve the quality of wine at this delicate stage. These are the little attentions that take place at every stage of the grape process that leads to the best organoleptic characteristics product.